When you have strong opinions you also (hopefully) accept that others can have equally strong, and possibly differing opinions. Oh, how I love a good debate. If you can change my mind on something, fabulous!! If I change your mind. fabulous!! If we both walk away unchanged in our opinions, but feeling even more resolved about those opinions, even more fabulous. Because no one wants to be a sheep. One subject I have been vocal about for decades is vaccination. I am pro-vax. Always have been. Over the years, I have noticed that something interesting happens if I write, or "reshare", anything about vaccinations. Even something innocuous. The anti-vax bullies come out. I could debate with you why I think the anti-vax stance is dangerous, and unfounded, but that's not what this post is about. And not all anti-vaxers are bullies. But you cannot write, or say, a single word about vaccinations without the horde descending. They are fanatical. And you encounter them in every possible forum. Back in October of 2014 I posted to Linkedin, a professional network, an interesting letter I found on Imgur from a mom of an immuno-compromised child to anti-vaxers. It was an intelligent, and heart-felt letter (you can find the linkedin post here). Linkedin is a PROFESSIONAL networking site. The post was shared amongst groups on Linkedin. In the "Teachers" group the attacks on me PERSONALLY for sharing this post were horrific. For simply sharing. I was told that there was "no way in hell you should ever be allowed near a child", I was messaged privately and threatened, I was called every vile name possible. ON A PROFESSIONAL SITE BY PEOPLE WHO THINK OF THEMSELVES AS PROFESSIONAL WHO TEACH OUR CHILDREN. I was flabbergasted. Stunned. Wounded. No reasonable debate. Just attacks. I sought out solace from fellow authors and found out this is actually exceedingly common. Whenever people group together, share in something they identify with, there will be fanatics. But the Anti-vaxer fanatic seems to be a breed unto themselves. And they have a dance. Yup, their very own dance. Its a 3 step dance, followed up with the "dip" , the grand finale. If you ever write, share a post, or heaven forbid share an opinion on vaccination that differs from theirs, you will be treated to the dance. Don't take it personally. Don't let the dance hurt you. Simply see it for what it is. A Bully Boogie. So, how DOES an anti-vaxer boogie? The first step is to cite some scientific "fact" that vaccines are harmful. Cause autism. Whatever. These "facts" are easily debunked, because, well, they're not facts. The statements are simply not true, cannot be verified or proven, and the opposite can EASILY be proven. Next comes Personal freedom. The "this is MY choice" argument. But they only support personal freedom if its THEIR personal freedom. Their actions (or choice of inaction) imposing on others personal freedom, safety and even the very lives of others is not allowed to be discussed. Ever. After the Personal Freedom step comes the "Big Pharma" , or "Big Brother/Government" conspiracy theories (or the ever fabulous "Government in Cahoots with Big Pharma" conspiracy theory). This step is the most fun to watch. Quite entertaining. Once you start letting your inner conspiracy theorist show, well, frankly, you add more validity to the OTHER opinion. And you give us a good giggle too. But then, wait for it, just like in some old 1940's musical, the dance comes to an end, with the dip. With Fred Astaire and Ginger Rogers it is an elegant end to a beautiful dance. With anti-vaxers, its more like a dipstick. Covered in toxicity. Sometimes they get so excited in their Bully Boogie that they skip steps and head straight to the dip. Meghan Duff,author of the wordpress blog "A Christian Aspie Perspective" and a wonderful autistic self advocate, recently wrote an open letter to anti-vaxers. 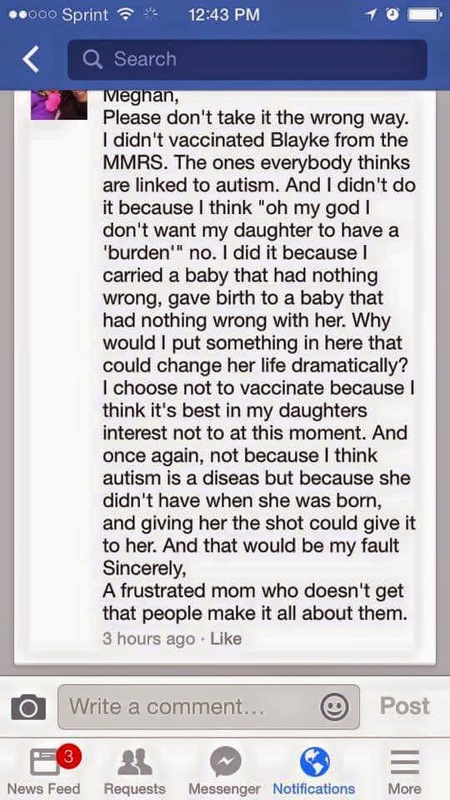 Directed in particular at those who use the ridiculous BS that vaccines "cause" autism. Let the Bully Boogie begin. She was attacked. Mercilessly. One woman, trying to sound as if she WASN'T saying Autism is worse than the risk of death, responded with the following. Guess what? You are saying autism is a disease. You are saying that something is WRONG with autistic people (and remember this is a DIRECT response is to a letter WRITTEN by an autistic woman). You are saying you'd rather place your child (and everyone your child comes in contact with) at risk for a very REAL possibly deadly disease than to research and see your fear is unfounded, but worst of all because being autistic would be WORSE. Nice lady. Very nice. But for a change of pace, I'm going to get off my Autism Advocacy high horse and show you anti-vaxers don't discriminate. They bully those who disagree with them even if they AREN'T part of the autism community. I met Katherine Hollinsworth when a mutual friend's jazz band was ending its long term gig at a local hotel. She is bright, funny, and unpretentious. We get along like gangbusters. Katherine, like so many of us, was horribly upset by the needless measles outbreak recently in the States (which continues to expand). On her personal facebook wall she wrote of her concerns, implored those who have an anti-vaccination stance to research. The private messages and public comments started immediately. Mentioning vaccinations seems to send out something into the stratosphere that draws them in like a magnet. SIXTEEN pages of comments, most with links to "natural news dot com" and "mercola" and many other story-telling-but-passing-off-as-facts sites (Seriously? people STILL don't know to check validity of an article or website with Snopes ?). Flouride-gate comments competed for attention. And the attacks. Personal, revolting attacks. On a woman most would find far from reproach. For simply stating, on her own personal facebook wall, her own personal opinion. 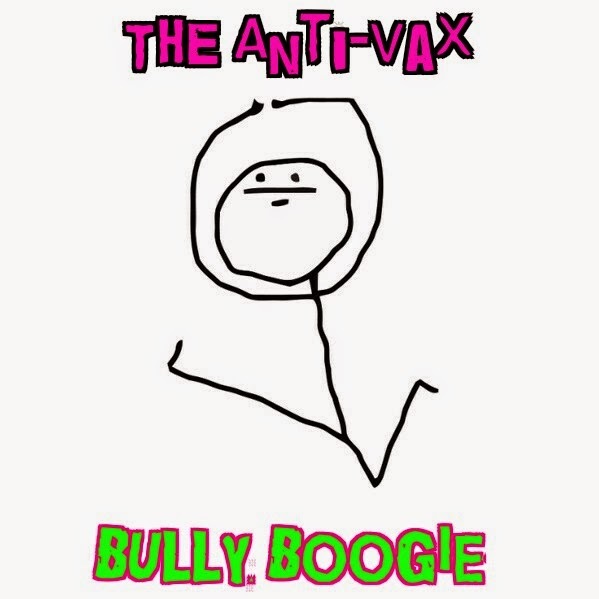 The Anti-Vaxxer Bully Boogie. Sigh. Any refutation of their assertions, with facts, REAL FACTS, calls forth from anti-vaxxers the most vile-mouthed, abusive, vitriol-laced sputum. Yes, when you have other at-odds parties you will find bullies. But no where near to the extent as in the anti-vax community. And you just can't have the Anti-Vax Bully Boogie without the "dip" (or dipstick). So next time an anti-vaxer starts to boogie with you, don't concern yourself. Just sit back, relax and wait for #thedip. Nothing infuriates an anti-vaxer more than you refusing to dance with them. There is NOTHING Wrong with me! Both the funniest and best piece I've seen on this phenom.